Yesterday morning I shot a series of promotional photographs to support an upcoming production at The Street Theatre. 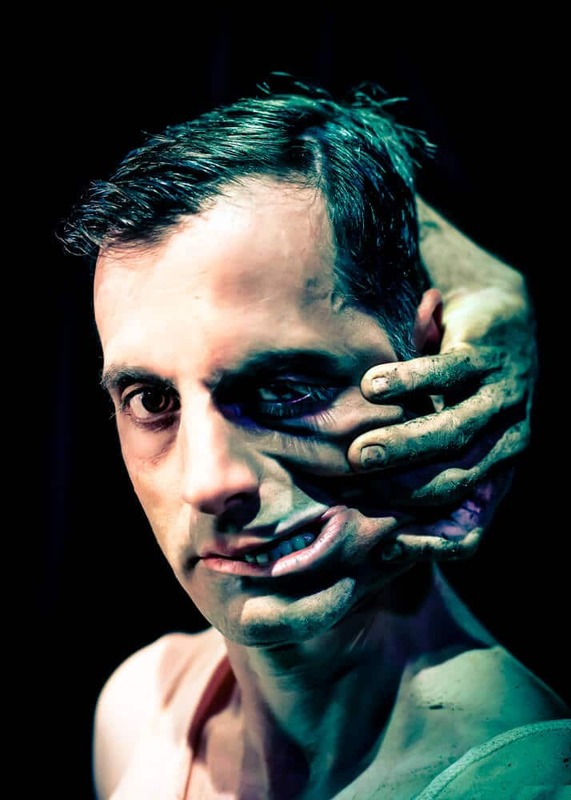 The production is called Pigman’s Lament and stars Raoul Craemer in a taxing solo performance. The story revolves around a man who is physically haunted by the memory of his dead grandfather. Raoul, who you may remember from the Beard/No Beard headshot series from earlier in the year, plays both roles. The brief for the promotional image called for the expression of the duality extant in the central character … to somehow combine the rational present character with that of the man beyond the grave. I chose to take two shots and merge them together to form this dualistic one … Raoul’s hand reaching from behind his head and contorting his face emphasises the extension of this nasty force from the past. The picture will appear on all promotional materials for the production and I’ll post a picture of the poster when it gets printed. Now that is a truly confronting image. How amazing for you that it is going to appear on all the promotional material. The purple gives it a supernatural element, i think. Fantastic, in the true sense. The theatre folks liked it too … this is a good thing.